Good news, everyone! Someone finally took two of my favorite sci-fi properties and mashed them together - Star Wars and Futurama. The results are surprisingly awesome. So much so, I had a hard time cropping the image for the thumbnail - I didn't want to cut anything out. Even so, you'll still want to check out the full version below. Which is your favorite character from the poster? 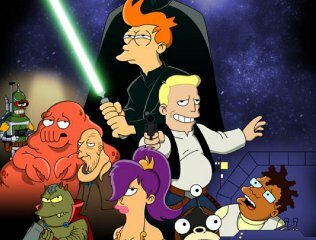 Maybe they'll do a Star Wars special like they did with Family Guy? Bender as Boba Fett is fabulous. Futurama is a fun show. I love the heads in the jars. Ha! 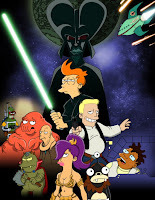 That's some awesome futurama artwork there.